NISA’s character is actually a personification of NIS (Nippon Ichi Software), so her Japanese name is taken from that. She was renamed in the localization to match the American branch during the localization. From the 5pb. DLC in the original game, maybe one of the most confusing ones since it looks like NISA inserted a plot point where there was none. Iffy runs into 5pb. and finds out her real name is… 5pb.-chan (her “normal” name is just 5pb. ), which is how they end up getting bound together for the rest of the subplot. Obviously there’s no counterpart to -chan in English, so NISA localized this by giving her a completely new “real name” instead. Not actually a change but some people don’t seem to be aware. Linda was always called Underling in the Japanese version as well, they just happened to use the Japanese word for it. While no official explanation was given (that I can remember), supposedly NISA made this name change was to make a reference to piracy, although it had the unfortunate side effect of making it way too close to Pikachu too. Some people wondered if Warechu was a reference to “warez” but that’s more of a Western word, it’s more likely based on the word “warui” (which means “bad”). Idea Factory International (IFI) would end up reverting this change when they got hold of the series. 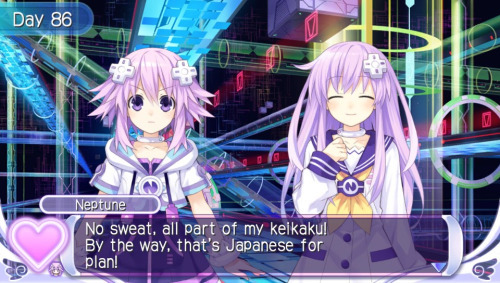 The CPU that came before Neptune, her name has been always Uranus in the Japanese version but for some reason NISA localized it as Caelus in mk2 (Caelus is another name for the Uranus god). This change was reverted by IFI in the later games. Incidentally, this is most likely why Uzume’s surname is in Japanese. While her surname is pronounced Tennouboshi, the kanji (天王星) matches that of “tennousei”, which is the Japanese name for the planet Uranus, which has led to some fans calling her Uzume Uranus early on. Trying to localize it like that would have created a horrible mess. Probably one of the changes with the most complaints in part due to the pun not having been noticed that easily at first. Her name is essentially a mispelling of Pluto in Japanese which is written プルートー (purūtō). It’s surprisingly easy to guess the katakana spelling wrong which is probably why people were confused at the time. Plutia gets two nicknames. One is Plutie, which in Japanese is Pururun (ぷるるん), the other one is Sadie which in Japanese was actually ドＳ (a term used to describe sadists). It’s worth nothing that “pururun” happens to be the onomatopoeic sound for bouncing (especially for certain pair of round things). It’s not as big change as it sounds: it’s actually intended to keep the pronunciation more or less the same. Also, for some reason Compile Heart’s romanization of her name is Pish which completely ignores the ending E sound. Important remark: her name is intended to sound like PC, but this refers more specifically to the PC Engine, which in the West is known as Turbografix. 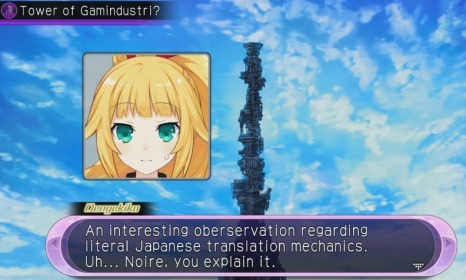 This caused enough confusion that NISA mistakenly said she represented PC (as in the computer), and even more recently the confusion exists, as IFI accidentally mistranslated “PC Continent” as “Peashy Continent” in the Nitroplus DLC for Victory II (thankfully this was just in Nitroplus’ bio, in a cutscene it’s translated correctly). Actually not a change, but worth noting because of the meanings of the name. First of all, her name is Histoire’s name but changed to start with “kuro” (black), so her name literally means Dark Histoire. Her name also happens to be the word for “believe” in French, which is fitting given she wants to make history sound interesting instead of just documenting it. (Editor’s note: it also fits in with the four main CPUs’ French theme) And Croire herself insists her name stands for “chronicle”, which makes sense because in Japanese it also starts with “kuro” (クロニクル – kuronikuru). Her nickname in Victory II is クロちゃん (kuro-chan), which really is just a shortened version of her name. So no, she was never really called Darksty in Japanese, Crostie is indeed an accurate localization (could have also been Croirie or whatever else as well). Just a small spelling change. Probably for the sake of pronunciation. Er… yeah. His name wasn’t great in either case. His Japanese name literally means “evil minister” (in the politician sense of “minister”). It’s not hard to see how they got from “evil” to “Badd”, but the name definitely lost its impact (sounding like the Moonwalker villain isn’t helping matters). I won’t bother with most monsters but dogoos are the iconic ones from the series so here we go. Their Japanese name is slinu (スライヌ), which is a mix of slime + inu (dog). Their English name (dogoo) is a mix of dog + goo. In the end it’s the same pun as close as it was feasible. 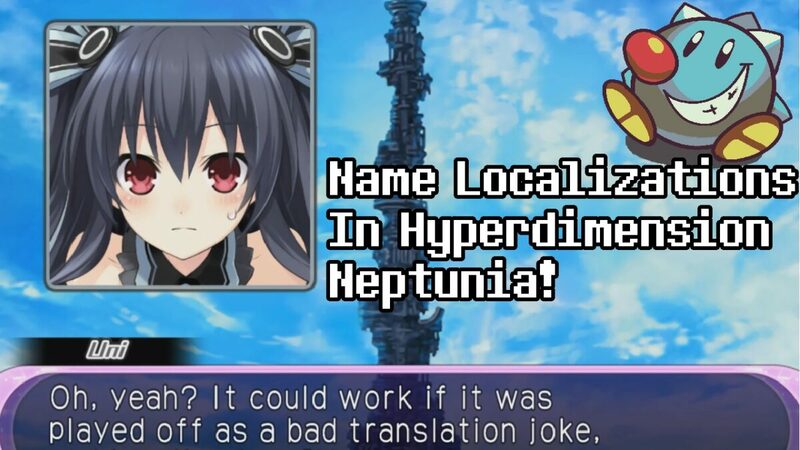 With a few oddities (mostly toward the end of NISA’s tenure with the series), the Neptunia cast’s names have been kept fairly similar in intent between Japanese and English. Changes made were generally to make the intent more clear to the western audience while keeping the meaning the same; more or less the exact point of a localization. Idea Factory International, for better or worse, has been taking an almost excessively literal approach to localization with recent titles, so it seems unlikely that many major name changes will hit the series in the future. There’s more to localizations than names of course, so an article on term changes (such as “Magic The Hard” to “CFW Magic”) should be coming soon. If you have specific questions for a future article to focus on, feel free to comment and ask!